Yeah. It sounds gross. And, well, it might be. The owner of a Dairy Queen in Calgary, Alberta really wants to know what the hell that smell is. 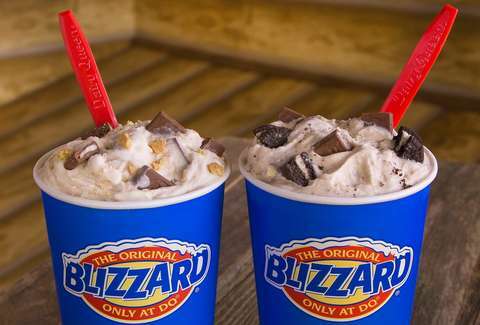 Sujad Bandali, the DQ owner, is offering a free Blizzard every week for a year to anyone who can find the source of a weird smell near the restaurant's entrance. The foul stench has hung in the air of the DQ since it opened in 2015, reports the CBC, and it simply won't go away. "I smell it like propane and then sometimes you smell it like hydrogen sulfide kind of thing and sometimes it’s just some kind of gas," he told CTV Calgary on Monday. The potent aroma was first noticed when the store opened. Since then the owner has had firefighters take a look, the natural gas company ATCO checked twice for a gas leak, there were carbon monoxide tests, the sewage system was flushed twice, and other experts have taken a look. Nonetheless, the smell persists. So, the Blizzard deal was launched a few days ago. It's a mystery, deepened by the fact that Bandali says not everyone seems able to smell the stench. "It depends on how sensitive the person's nose is. Half the staff can smell it, half of the staff can't smell it," he told the CBC. "We've had customers walk in then walk out. It gets quite embarrassing." Customers have already begun offering ideas, including that it could be freon from the freezers. Yet, no one has cracked the riddle to date. If you can figure it out, there's a lot of ice cream in it. "We are really, really hoping somebody can come up with a solution for us," Bandali told the CTV.